Every city needs someone to tell its story. . . In Vancouver, we have been privileged to have two such photographers who told the story of our city as it appeared in earlier decades. This is a city that seemed more like a town, with an interesting mix of cultures. From Little Italy, The Drive, Chinatown and more, our city is populated with immigrants and locals who blend together in the downtown byways. Following is the front cover of a book of 'city' photographs by Fred Herzog. It's in our library and is rich with scenes which are now gone forever. The streets have changed, and so have the people. Herzog wanted to show the real city life, not the shiny and the glittery, but instead, the greasy spoon cafes, the once popular areas starting to decline, but most of all the people on the streets living in that moment of neon signs and bright lights. He showed the wet streets in the rain, the shadowed storefronts and the sunny days when women took the little ones for a stroll. . .
Another man of the streets, Foncie concentrated his talents photographing the people of the city, capturing moments in their lives as they strolled by in front of his camera. If you wanted the photograph, you could drop by his shop and purchase it for a minimal amount. He chose the subjects. He enjoyed the act of taking the photos and accumulated an impressive amount of them. From sailors on leave, to mothers and their children, to pals going to lunch after shopping, he caught them all if they happened to walk past his camera lens. In Foncie's Photos we see Fifties fashion and a time captured when 'going downtown' meant hats and suits for men, and hats, heels and gloves for the women. In the early and mid-sixties he captured the casual trends of youth and the British influences in hairstyles. Following are a couple of shots taken in the 1950s to illustrate, and many more were featured in a retrospective at the Vancouver Museum in 2013. Here was a man who liked people and who had an affinity for composition and the skill of capturing the essence of the moment. Foncie's Photos was known to almost everyone who lived in Vancouver, and most families have a few of his images in their possession. 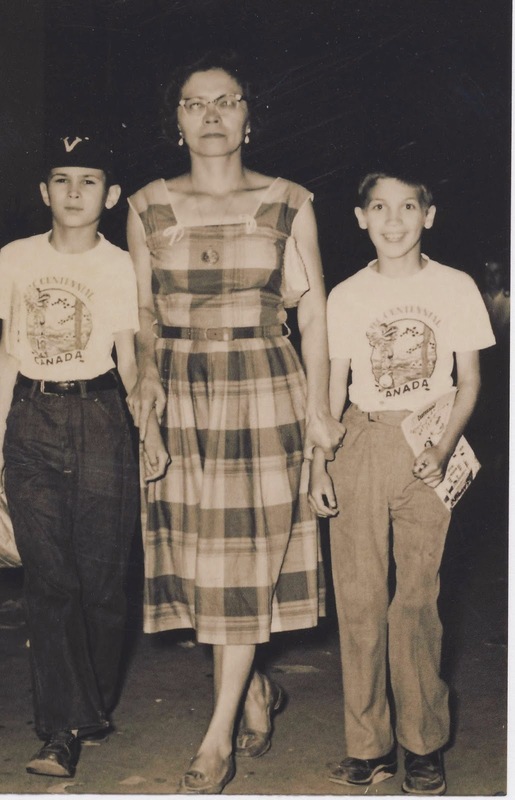 A mother and her sons. . .
A ladies' outing. . .
Is there someone who's known for documenting your city or a photographer associated with capturing the history of your favorite place? OR Do you photograph elements of your city for posterity? Do you know of a repository of city photographs in your area (an archives)? Please let me know you were here by leaving a comment. I'll try to get back to you when I can. I'm very limited at present as to visiting, but I do lurk about. I'm considering the April A to Z Challenge, but would need to prep in advance. I'm currently only able to maintain a minimal blogging presence. I love old pics like that and I have always admired photographers who aren't afraid to capture people on film (my fave being Dorothea Lange). I love old pix like that too, JoJo. I'll have to check out Dorothea Lange, I'm not familiar with the name offhand. Foncie was an interesting guy. Those photographs become a moment in time, one that no longer exists. Glad someone was there to capture them. Hope you can join us for the Challenge. Yes, tons of prep time. I'm currently working on my post for M.
Thanks, Alex. I'm working on whether I've got something for every letter right now. . .thanks for dropping by! I love the genuine smile of the young boy to the right in the first of Foncie's photographs. 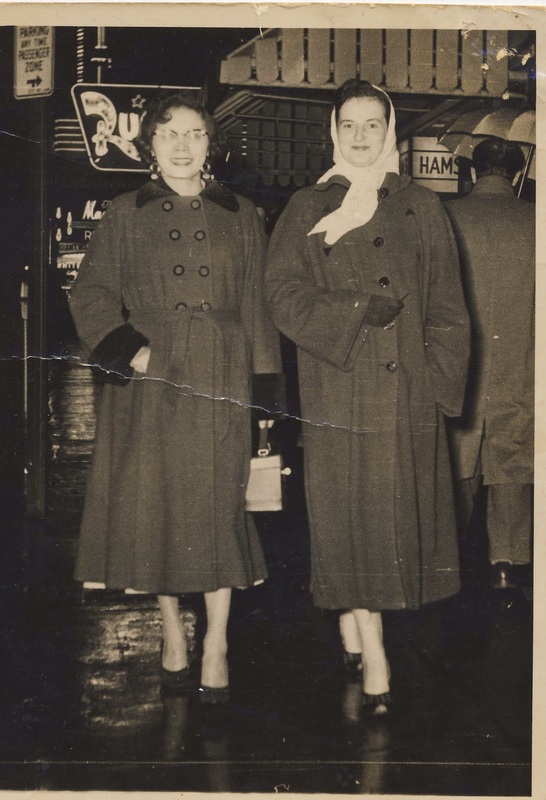 Yes, there was a time when going downtown meant dressing classy. Now, they still dress classy -- but it seems third class! I pray both your husband and daughter are doing better!! Isn't that just the most friendly face you ever saw? I love the determination on the face of the mother too. Protecting her young boys, or else restraining them. . .Thanks for the good wishes, Roland. Much appreciated. I love these old photos, they tell so much of a story! Don't they make you wonder at the people and the times they lived? I'm fascinated by period photos. Hope your modeling ventures are doing well, Hayley-Eszti! I love old photos like this, especially ones that are rich in history. As for our small cowtown... it's best we don't document its goings-on. Unless you want sepia toned pictures of some redneck tipping over a cow while chewing a giant wad of "tobacky" that he spits onto his unfinished GED test. Sounds like the town I spent my childhood in, ABTS! That was reason enough for me to say, 'that town wasn't big enough for me'. . .no tipped cows please. I do like looking at old photos, especially ones that show me what places were like in the past. 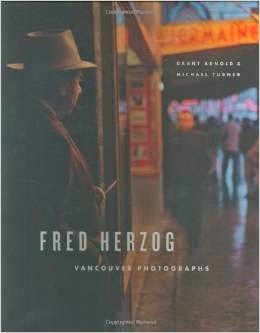 I really like the cover on the Herzog book--looks like a scene from an film noir. I don't know of anyone who takes photos around my area and I certain don't. I'd love to see photos from the area where I've been living for the past 17 years. It's funny but I used to drive by this development where our house is and don't remember at all what it used to look like. I think sometimes we just don't pay attention to certain areas. Someone told me there were some sleazy old motels and other businesses here. Someone else told me that 40 years ago it was a big orange grove. Documentation photos are an important part of deciphering the past. Hope you're able to join us for A to Z.
I love old photos, Lee, since they get my imagination going. Imagine how many images are floating about now with everyone able to take more photos and upload them. I have several of my shots that come up in searches in Yahoo France. Now if I can just finish that Paris novel. . .
That sounds like a great gift, LG. We've bought books on other neighborhoods where we've lived too. I love history, even local history. Hi DG. There's no better way to document a history than by photographs. It is always exciting when long-forgotten photos turn up or a book is published like you've shown us today. It's amazing how places change over time. Trust all is on the up and up at your place! I've had to recently go through some of my MIL's photos and found some really interesting ones including a map drawn of the old DEW line in North America. (Hub's father was there). Things are looking up, but time sure is scarce. . .hope you are safe from all the fires there (Australia) that we hear about. It's nice to see the less touristy aspects of a city. The photos of Vancouver are probably very interesting. They are, but I couldn't show any here as they are in his book, and protected. There are links to more information on Herzog.